New Generation AMD EPYC™ Processor-based Solutions | A+ Solutions | Super Micro Computer, Inc.
Supermicro RSD, a rack-scale total solution, empowers cloud service providers, telecoms, and Fortune 500 companies to build their own agile, efficient, software-defined data centers. Built on industry-standard, RESTful Redfish APIs from Distributed Management Task Force (DMTF) and open-source Intel® Rack Scale Design software framework, Supermicro RSD integrated rack solution can be flexibly configured using Supermicro's broad and optimized server, storage and switch hardware products. Supermicro RSD total solution accelerates large scale data center deployments by elevating provisioning and management to the rack level and maximizes resource utilization through disaggregating compute, network and storage resources distributed within a rack or across multiple racks. 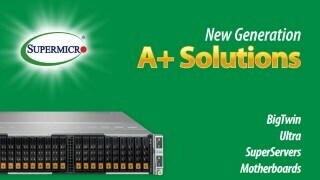 Supermicro and Microsoft have partnered together to deliver industry leading "fully certified solutions". These solutions are delivered on highly optimized and flexible Supermicro Server and Storage Systems. Supermicro Systems are designed to provide significant advantage to these solutions in the areas of power efficiency, performance and overall system optimization. These design principles coupled with bringing innovative technologies at an accelerated pace drives time to market value for Microsoft Solutions. In case of some of these disruptive technologies like NVMe, Supermicro is an established leader with the broadest range of products that customers can choose from. Supermicro a global leader in compute, storage and networking technologies, including green computing, has certified its complete portfolio of server and storage solutions to support the SAP NetWeaver® technology platform running on Linux. Supermicro is collaborating with SAP to bring its rich portfolio of open cloud-scale computing solutions to enterprise customers looking to transition from traditional high-cost proprietary systems to open, cost-optimized, software-defined architectures. To support this collaboration, Supermicro has recently joined the SAP global technology partner program. Supermicro and Canonical have partnered to deliver solutions that feature Kubernetes containers. This solution is built and validated with Supermicro SuperServers, SuperStorage systems, and Supermicro Ethernet switches that are optimized for performance and designed to provide the highest levels of reliability, quality and scalability. The Canonical Distribution of Kubernetes (CDK) is pure upstream Kubernetes tested across the widest range of clouds - from public clouds to private data centers, from bare metal to virtualized infrastructure. Canonical also provides a rich ecosystem of tools, libraries, services, modern metrics, and monitoring tools to make CDK easy to consume so you can innovate faster. Supermicro and Canonical have partnered to deliver solutions that feature TensorFlow machine learning. This solution is built and validated with Supermicro SuperServers, SuperStorage systems, and Supermicro Ethernet switches that are optimized for performance and designed to provide the highest levels of reliability, quality and scalability. Canonical, the company behind Ubuntu, helps organizations make the most of Ubuntu. The Canonical Distribution of Kubernetes (CDK) is pure upstream Kubernetes tested across the widest range of clouds. Canonical also provides a rich ecosystem of tools, libraries, services, modern metrics, and monitoring tools to make CDK easy to consume so you can innovate faster. Supermicro has quickly become a global leader in cloud system technology, with green computing platforms developed for a range of markets. With Supermicro, you can be confident that you are working with a technology-leading, innovative, and knowledgeable partner who makes your business’ digital transformation simple. Supermicro's VSAN Ready Systems have been created to focus on getting a simple hypervisor-converged storage cluster up and running as quickly as possible. Supermicro in Partnership with Intel offers a total solution for Lustre on ZFS with Supermicro's industry leading hardware, software and services infrastructure. The evolution of software defined high availability platforms like ZFS running on Linux now make it possible to meet the performance requirements of HPC on open industry standard x86 platforms, reducing storage costs by up to 90%. Supermicro's HCI offerings are Windows Server Software-Defined (WSSD) validated software-defined data centers (SDDC) premium solutions that are built on Supermicro's industry leading All-NVMe/Hybrid systems and Microsoft Windows Server 2016. Supermicro is now offering Microsoft Azure Stack HCI solutions that are built on Supermicro's industry leading All-NVMe/Hybrid systems and Microsoft’s latest Storage Spaces Direct (S2D) features in Windows Server 2019. Excelero delivers low-latency distributed software-defined block storage for large web-scale and enterprise applications. Excelero's NVMesh enables shared NVMe across any network, and supports any local or distributed file system. Leveraging Supermicro high-end servers, Excelero NVMesh solutions provide customers with the fastest storage performance and best user experience. Utilizing big data analytics is no longer a question of when, but how. Enterprises deploying Hadoop solutions need a high performance, scalable and reliable infrastructure and can expend a large amount of resource searching for the best architecture and the most capable solution provider. The Supermicro Hadoop Solutions are certified server, storage, networking, software and service configurations that take the guess work out of designing and deploying a truly scalable Big Data infrastructure. 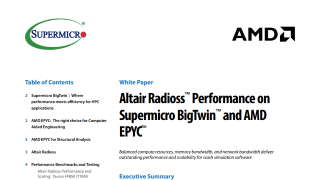 Supermicro is actively innovating in building HPC solutions. From design to implementation, we optimize every aspect of each solution. Our advantages include a wide range of building blocks, from motherboard design, to system configuration, to fully integrated rack and liquid cooling systems. Using these tremendous array of versatile building blocks, we focus on providing solutions tailored to the customers’ need. At Supermicro, we take pride in building HPC solutions from the ground up. Supermicro can tailor HPC solutions to meet any variety of workloads: compute intensive, high throughput, or high capacity storage applications used in different industries. Supermicro HPC systems can be bundled with a variety of open source platform and commercial applications, making it a truly turnkey solution. Supermicro has developed a line of fully configured SuperServer® solutions to address the rapidly growing Virtual Desktop Infrastructure (VDI) market. 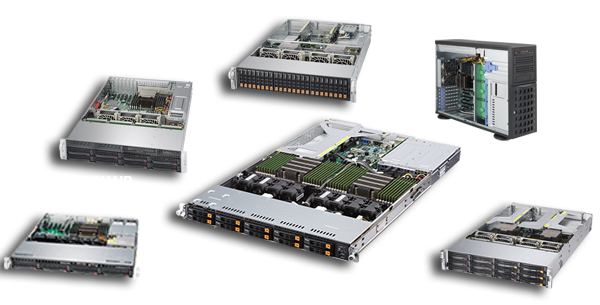 These solutions include a Supermicro 1U, 2U, FatTwin™, or 4U Tower SuperServer® configured with 2x Intel® Xeon® E5-2600 v4/v3 CPUs, up to 3TB ECC 3DS LRDIMM or RDIMM DDR4-2400MHz in 24 DIMM slots, and featuring NVIDIA Tesla M10 / M60 that allow deliver accelerated virtual desktops to any user, anywhere, any devise. Server management utilities assist data center system administrators to manage hardware issues such as server availability and firmware upgrades to reduce server downtime. Supermicro has developed a multifunction suite of tools that can perform health monitoring, power management and firmware maintenance to help deploy and maintain servers in data centers. A+ Servers are Your Best Choice! 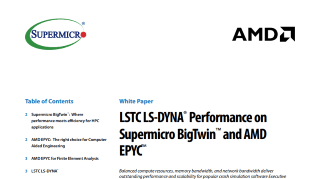 Supermicro's latest range of AMD EPYC™ 7000 Series SoC-based server and storage solutions offer new levels of optimized performance per watt per dollar, and deliver outstanding core density, superior memory bandwidth, and unparalleled I/O capacity. Supporting up to 32 "Zen" cores and 64 threads per socket, these Supermicro solutions are tightly coupled with high-throughput, low-latency, hot-swappable NVMe storage, up to 4TB of DDR4 memory over 8 memory channels per socket, and up to 128 PCI-E 3.0 lanes on a dual- or single-socket system. Supermicro's new generation A+ solutions supporting AMD EPYC™ enable a new range of powerful and energy-efficient server options to radically lower data center TCO through an optimized balance of compute, memory, I/O, and storage resources.